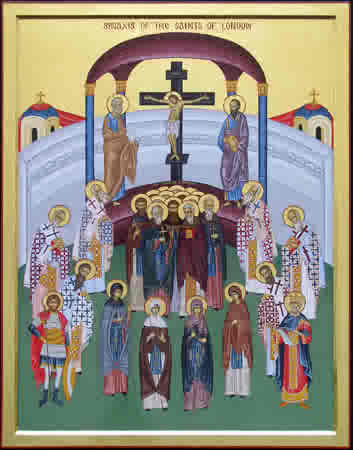 In this icon of the Saints of London, there is in the lower center part a row of four female saints. The first on the left is Hildelith, 2nd Abbess of Barking Monastery. To the right of Hildelith is St. Ethelburga, in a brown monastic cloak, facing forward. On this 15th day of our journey with the Celts to the Creche, we meet St. Æthelburga (Æthelburh, Ethelburga) who was the first Abbess of the double monastery (meaning men and women live and worship on the same monastic grounds under an Abbess) of Barking on the outskirts of London that was founded about 660. This large and prominent Abbey was in existence for 900 years until it was dissolved during the Henry VIII’s Dissolution of the Monasteries in 1539. You may desire to continue reading more about Aethelburga of Barking or go on to the Meditation towards the end of this page. Her early life and family: Æthelburga was born in Lindsey in Lincolnshire, likely of a royal family. She was the sister of Eorcenwald, Bishop of London, who supposedly converted King Sebbi (reigned 664-694) of Essex to Christianity. Her brother Eorcenwald, Bishop of London:It is recorded that Bishop Eorcenwald with family money helped finance the building of two monasteries, Chertsey on the Thames in the land of Surrey and Barking in Essex, now a suburb of London. Yet, it is interesting that there is an early charter believed genuine and drafted by Bishop Eorcenwald in the reign of King Sebbi of Essex, that records a grant of lands in Essex by a certain Æthelred to Æthelburh and Barking. This is dated to between 686 and 688. 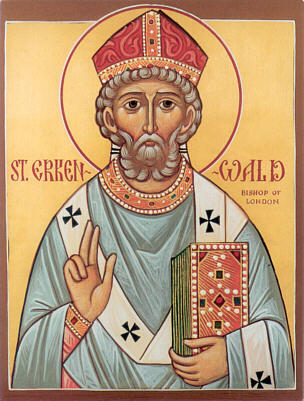 Eorcenwald was the Bishop of London from 675- 693. He succeeded Bishop Wine and he was the choice for Bishop of London by Archbishop Theodore of Canterbury. He died at Barking Abbey, but he was buried in St. Paul’s Cathedral in London. How we know about Æthelburga: The main source of information on Æthelburga’s life is Bede’s Ecclesiastical History of the English People which recounts the foundation of Barking, the early miracles there, and Ethelburga’s death. Evidently a Life of Æthelburga was in circulation in Bede’s day as he refers to a book which was the source of his information on her. Bede describes Æthelburga as “upright in life and constantly planning for the needs of her community”. He also said that she “established an excellent form of monastic rule and discipline there.” During her tenure, the plague was virulent and Bede has two stories of how Æthelburga and the Community of Barking dealt with the many members who died. 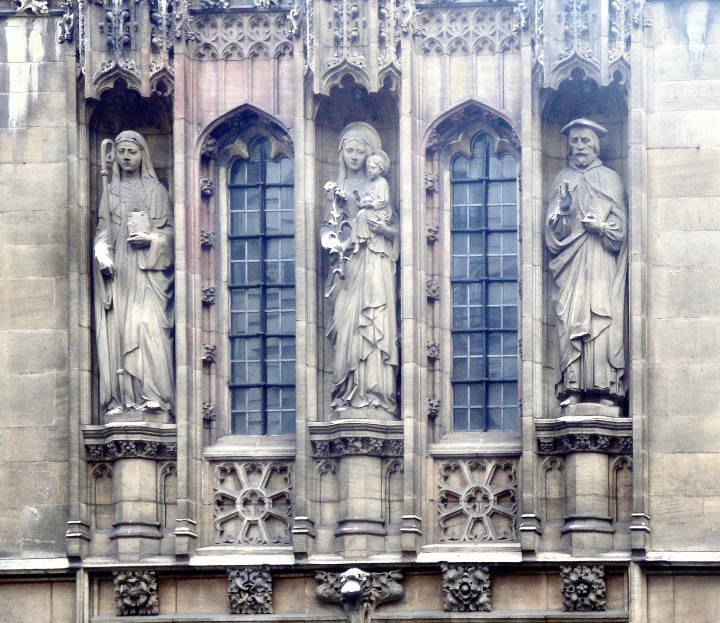 Stone statue of St. Ethelburga on the left. All Hallows Church, Barking. 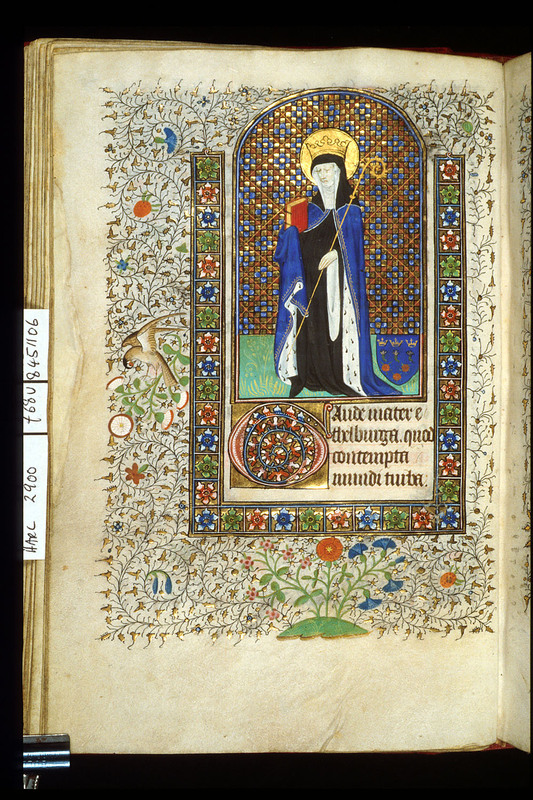 Notice her Abbess’ staff in her right hand and her Abbey in her left hand. Place of Resurrection: Bede records a vision by a nun of Barking named Tortgyth (also known as Theorigitha) who was the mistress of the novices at the Abbey. She saw a body wrapped in a shroud being taking to heaven pulled up by golden cords. She realized that it was someone from their Community. A few days later Æthelburga died (c686) and they realized that the vision was about their Abbess. She was buried at Barking. Interestingly, three years later, Tortgyth received a vision of Æthelburga and said, “I am so glad that you have come; you are most welcome.” Tortgyth learned from the vision that she was soon to die, and her death came only a day later. Æthelburga’s Successor: Abbess Æthelburga was succeeded by Hildelith. It was to Hildelith and nine of her nuns that Aldhelm, Abbot of Malmesbury dedicated his Latin prose work, De Virginitate, a lengthy treatise on the merits of the virgin life. Aldhelm praised the women at Barking for their education, but berated them for golden embroidered headbands. Aldhelm wrote in very highbrow Latin and he obviously knew that the nuns of Barking were well educated and could understand his letters. 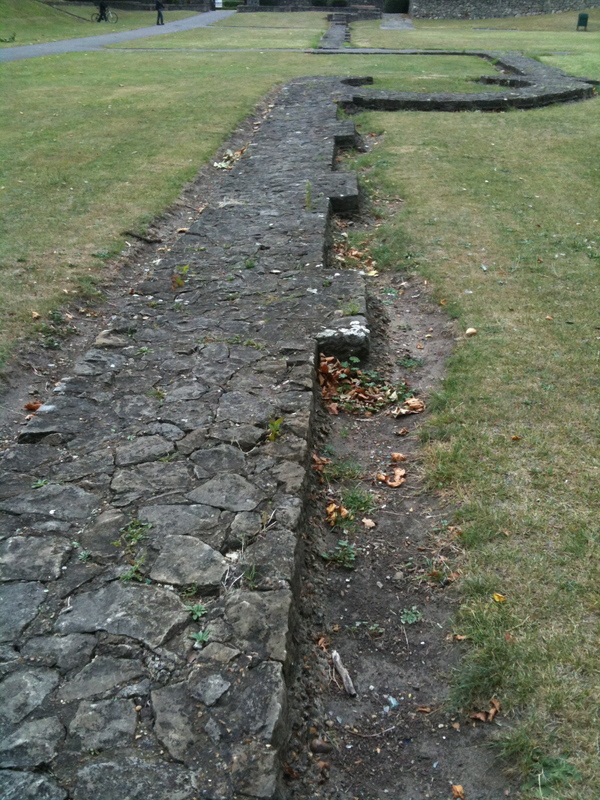 A view of a foundation wall at the ruins of Barking Abbey. I took this photo on my visit there in Sept. 2009. Barking Abbey’s history: Barking was destroyed by the Vikings in 870, but was reestablished as a Benedictine nunnery in King Edgar’s reign 100 years later with Abbess Wulfhild, whom according to Goscelin, Edgar tried to seduce. In medieval times, it became one of the richest and most influential abbeys in England. This Abbey was held in such esteem, that the Abbess of Barking Abbey held precedence over all the other Abbesses in England. The Abbey suffered greatly after a flooding of the Thames River in 1377. The Abbey existed for almost 900 years until King Henry VIII’s Dissolution of the Monasteries closed it in 1539. Today, one can visit the ruins of Barking that are located next door to the very active Sts. Mary and Ethelburga’s Church. I visited Barking in September 2009, had a yummy lunch in their tea room, and had an interesting time afterwards visiting the ruins. 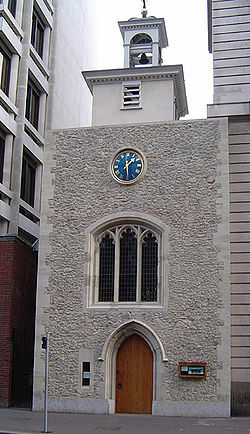 St.Ethelburga the Virgin Church in London: The church of St. Ethelburga the Virgin in the City of London is dedicated to her. It survived the Great Fire of 1666 and the Blitz of WWII but was extensively damaged in an IRA attack in 1993; however, it has been restored and is now a center for international reconciliation. On our long awaited, first trip to England in 1993, my husband and I had just gotten off the airplane and we were taking the double decker tour bus around the City of London. All of a sudden there was a huge explosion that rocked the streets. The tour bus we were on was redirected away from the center of London as the police quickly shut that area down. We soon learned that it was an IRA attack that had destroyed the ancient church of St. Ethelburga the Virgin. Gate into grounds of Sts. Mary and Ethelburga and the ruins of Barking Abbey. On my visit there, I ate a delicious lunch in the church’s tearoom. I took this photo on my Sept. 2009 visit there. Recent excavations of Barking Abbey have found timber building footings, evidence of weaving and a glass-working furnace, and a range of objects including gold thread, pins, manicure sets, style (used to write on wax tablets), and coins. Every act of violence in our world, between myself and another, destroys a part of your creation. Stir in my heart a renewed sense of reverence for all life. Give me the vision to recognise your spirit in every human being, however they behave towards me. Make possible the impossible by cultivating in me the fertile seed of healing love. May I play my part in breaking the cycle of violence by realising that peace begins with me. “Barking” by John Blair. Lapidge, Blair, Keynes, and Scragg. The Blackwell Encyclopaedia of Anglo-Saxon England. Oxford:Blackwell, 1999. 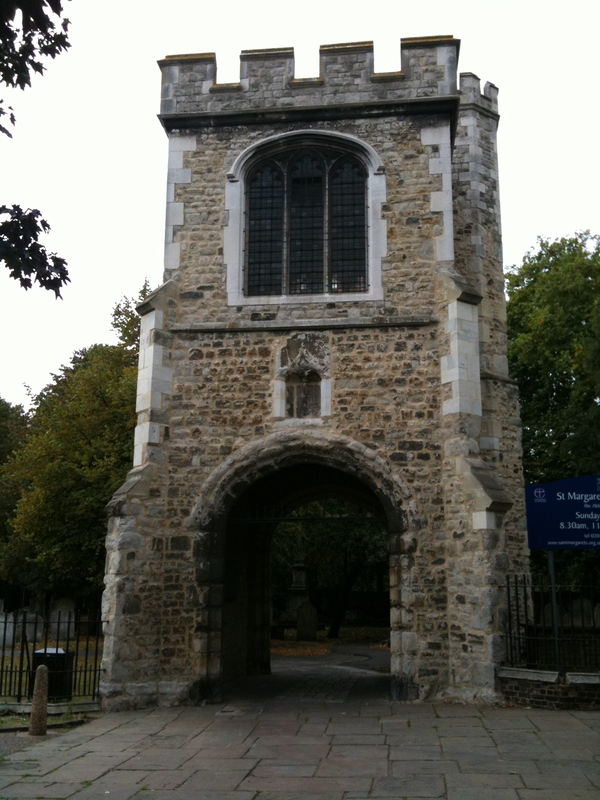 Barnes, Teresa L. A Nun’s Life: Barking Abbey in the Late-Medieval and Early Modern Periods. Master’s Thesis, 2004. Portland State University. (this is an excellent work on Barking Abbey). Bede. Ecclesiastical History of the English People, Book IV, chapters 6-10. Blair, John. The Church in Anglo-Saxon Society. Oxford, UK: Oxford University Press, 2005. Brown, Michelle P. How Christianity Came to Britain and Ireland. Oxford: Lion Hudson, 2006. Foot, Sarah. Monastic Life in Anglo-Saxon England, c. 600-900. Cambridge: Cambridge University Press, 2006. Gallyon, Margaret. The Early Church in Eastern England. Lavenham, UK: Terence Dalton Ltd., 1973. Horstmann, C. The Lives of Women Saints of Our Contrie of England. London. Early English Text Society by N. Trubner & Co., 1836, reprint. Kirby, D. P. The Earliest English Kings. London: Routledge Press, 1991, 1994 reprint. Leyser, Henrietta. Beda: A Journey Through the Seven Kingdoms in the Age of Bede. London: Head of Zeus, 2015. Lucas, Angela M. Women in the Middle Ages: Religion, Marriage, and Letters. New York: St. Martin’s Press, 1983. St. Ethelburga’s Centre for Reconcilation and Peace. London. Whitelock, Dorothy. Anglo-Saxon Wills, no. 2. Cambridge: Cambridge University Press, 1930. Wilson, David M., ed. The Archaeology of Anglo-Saxon England. Cambridge: Cambridge University Press, 1976. Yorke, Barbara. Kings and Kingdoms of Early Anglo-Saxon England. London: Routledge, 1990, 1992 reprint. __________. Nunneries and the Anglo-Saxon Royal Houses. London, UK: Continuum, 2003. This entry was posted in Uncategorized and tagged 40 day Celtic Advent devotional, Anglo Saxon Saints, Barking Abbey, Bishop Eorcenwald of London, Celtic Saints, Celts to the Creche, Hildelith of Barking, Online Advent Devotional, St. AEthelburga of Barking, St. AEthelburh of Barking, St. Eorcenwald, St. Ethelburga of Barking, St. Ethelburga's Centre for Reconciliation and Peace, Tortgyth of Barking. Bookmark the permalink.